Today was an exercise in exercise - nothing spectacular, just a chance to stretch my legs, really. It was forecasted to be very hot away from the coast in Contra Costa County where I planned to hike, so I figured I'd better start early and finish before noon. To that end, I was up shortly after 5a and hiking by 6:30a. All of the nine summits I visited were short hikes (two of them were drive-ups), but some of them were rather steep. It was warm from the start, more so than expected, pressuring me to finish before 11:30a and leaving the last two summit for another day. The summit is located on private property owned by someone who lives just below the top on the north side, off Lomas Cantadas. The better direction to access it is from the south via EBMUD's Siesta Valley Recreation Area. The De Laveaga Trail runs below the summit on the south side, leaving a short but steep climb up grass slopes to reach the property boundary and the summit. 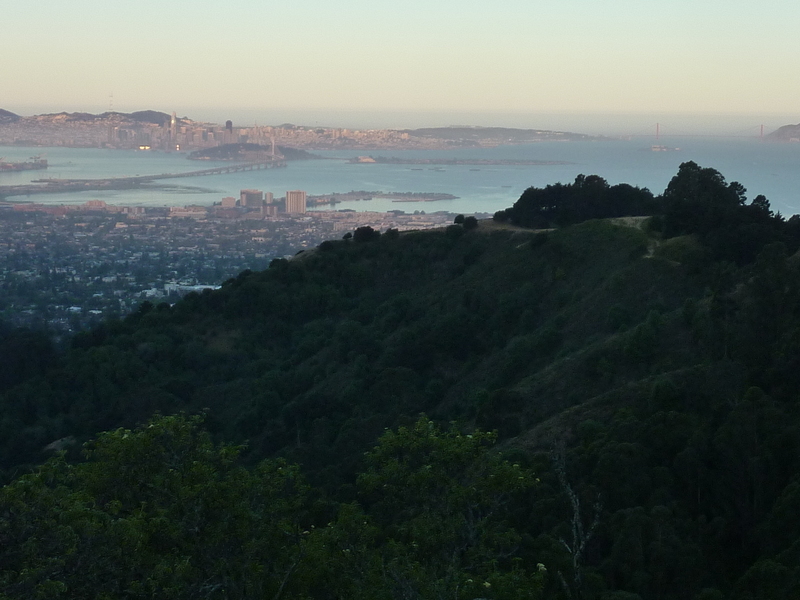 This ridge rises up from Berkeley towards the southern end of Tilden Park with fine views overlooking the East Bay. My approach was not far from the one I used for Eureka Peak and it took only a few minutes to get between the two trailheads. The trail climbs steeply for about 300ft before reaching the ridge and becoming easier. A use trail forks off from the main road/trail, reaching to the summit with a really great view of the SF Bay and the surrounding communities. Someone has spent a great deal of time lining up rocks in two spirals just below the highpoint. A nice place to spend some take taking in the views. This used to be EBMUD property but has been converted to a residential development. The development and everything else seems to be named after the same guy - Wilder Park, Wilder Fields, Wilder (the development), Wilder Rd, etc. The site of an old quarry, the lower slopes are slowly being developed into custom homes. The summit hill was nicely mowed to make the cross-country up to the top fairly easy. I drove to the end of Quarry Hill Rd, just above the Quarry House (which appears to be a swim, BBQ and community building for the the residents), as close as one can drive to the top. Just a few hundred yards up the hill from there. A drive-up. The highpoint is at the west end of the summit loop. The benchmark is likely under someone's driveway. This is one of several named summits within Briones Regional Park, one I'd missed on previous visits. I used an approach from the south off Panorama Dr. The paved road is surprisingly steep, but much of it is shaded. I followed the pavement to its highest point, then used a combination of the Mariposa and Russell Peak Trails, both dirt roads, to reach the top. There is an old picnic table nicely positioned in the shade at the summit with a pleasant view to the south. Had no luck finding the benchmark. Another drive-up. The least interesting peak of the day. Located south of Lafayette, Cat BM is the highpoint of the Lafayett Reservoir Recreation Area. Part of the EBMUD collection, one is supposed to have a permit to hike here, just like for Eureka Peak. There were plenty of folks hiking and even a few running during my short visit. I followed Marcus Sierra's GPX track I found on PB while I was consulting the peakbagger app after the previous peak. It was on my way to Fay Hill, so why not? The hike is surprisingly steep up a sometimes loose dirt road. The EBMUD benchmark is easy to find at the highpoint overlooking Lafayette and Moraga neighborhoods. The lower slopes of this modest, elongated hill are starting to be developed for new homes. The property is another EBMUD one, the top featuring a large concrete reservoir built into the top. I could have driven near to the top up the wide construction road whose gate was left open, but I decided to save my car the dust and hike the half mile to the top. The highest point is at the north end of the reservoir among a small clump of oak trees.